Buy 4 specially marked Red Baron multi-serve pizzas and You can get a FREE movie ticket to see Iron Man 3. The special codes can be redeemed HERE. 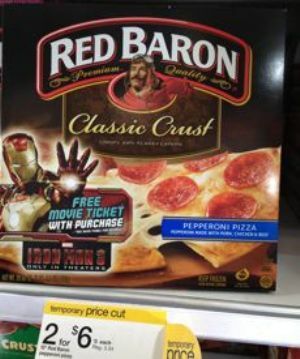 Even better, pick up Red Baron pizzas for only $2.75 with the $1/4 Target printable coupon. Helpful tip: after you redeem your codes it takes about a day for the codes to process and a ticket to get sent to your email. This doesnt count weekends.